Commons Speaker John Bercow has held his seat despite a challenge by the UK Independence Party's Nigel Farage, who remains in hospital after an air crash. Mr Farage, who said he was "lucky to be alive" after suffering rib and other injuries in Thursday's crash in Northamptonshire, finished third. Labour and the Lib Dems maintained the protocol of not standing against the speaker. Mr Bercow is a Conservative. He held the seat despite independent John Stevens polling 10,000 votes. 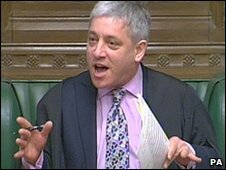 Mr Bercow retains a majority of more than 12,000. Mr Farage was unable to attend the count and is likely to remain in the John Radcliffe Hospital, Oxford, for "a few days", according to an NHS spokesman. The plane's pilot, Justin Adams, is in a stable condition in hospital in Coventry where he is being kept under observation. In a statement, Mr Farage said: "We've both had a miraculous escape. We are both very lucky to be alive." His spokesman had earlier said the former party leader had suffered "two broken ribs, a small chip to his spine and damage to his sternum". The aircraft, which was due to circle over the Buckingham constituency, came down at Hinton-in-the-Hedges Airfield near Brackley on Thursday morning. It was towing a banner bearing a UK Independence Party slogan. Taking to the stage after the constituency results were announced, Mr Farage's election agent Dave Fowler said he was "chomping at the bit" and asking for a cigarette from his hospital bed. He said on Mr Farage's behalf: "I assure UKIP voters and supporters that although we have lost this battle, the war carries on." Mr Bercow said he was "delighted" with the result but said he had been "concerned" to hear about Mr Farage's crash. "I wish him and his pilot full and speedy recoveries," he added. In his acceptance speech, Mr Bercow said he recognised many of his constituents were angry at being unable to vote for other parties, with 1,067 out of 49,402 ballot papers rejected. He said very large numbers of people had expressed "surprise, confusion or plain discontent at being unable to vote for candidates of the major parties". He said he would report those views back to the Commons to decide what approach should be taken in future. 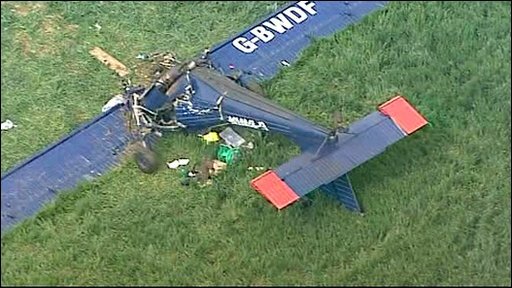 Mr Farage's crash is due to be investigated by the Air Accident Investigation Branch. Det Ch Insp Martin Kinchin, of Northamptonshire Police, said of the wreckage: "I think you can make your own judgment as to how lucky they were. Asked if the UKIP banner had become tangled in the aircraft, causing the crash, he said it was too early to speculate. A UKIP spokesman said the pair were trapped in the plane hanging upside down after the crash, but were "talking, conscious and breathing" during Thursday's rescue operation.